In collaboration with YOURS - Youth for Road Safety Project and the Caribbean Development Bank - the Government of Belize would like to open an invitation to your school to select future young leaders to apply for a unique opportunity to be trained as youth facilitators in road safety. Road traffic crashes are the single biggest killer of young people, killing more than HIV/AIDS, TB or Malaria. 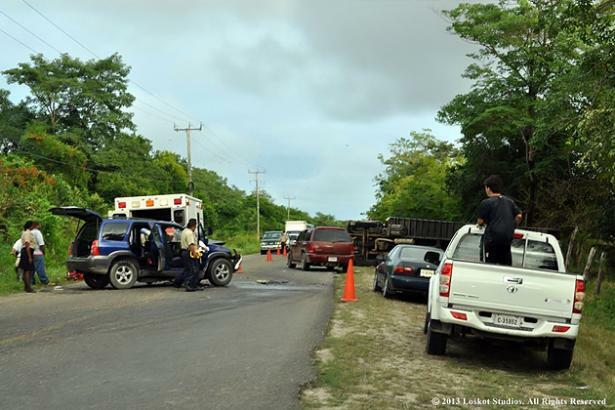 In Belize, approximately 30% of all road traffic fatalities are young people aged between 16 and 29. About 90% of these youth casualties are males. A combination of physical and developmental immaturity, and inexperience and youth-related lifestyles further increase the risk of young road users to road traffic collisions. We believe young people in Belize have not yet been adequately empowered to make informed choices to influence their own development. Young people are part of the road safety solution. YOURS is a global youth-led, non-governmental organization for road safety that acts to make the worlds safer for young people. They do so by advocating for youth and road safety issues worldwide; connecting and sharing road safety information with youth from around the globe and by developing youth capacities. They believe in the limitless potential of youth and we know you do too. As part of the capacity development programme, YOURS has trained young people in Cambodia, Italy, Kenya, Niger, Oman and Saint Lucia in road safety. What is expected through the YOURS Project? In June 2014, we aim to train 15 young leaders in Belize to become youth advocates and peer-facilitators for road safety. Over a two-week period, YOURS will take the selected young leaders through an intensive road safety programme and train them in all aspects of youth and road safety issues as well as key skills on running their own workshops with young people in the country. The training couples theory with practice and will give hands on experience as well as life-long transferrable skills and an unforgettable experience. Fluent or has a very good understanding of the English language. Highly motivated to make a positive change for youth and road safety. Feels comfortable in front of a group of people. Is patient and can explain issues in a simple way to young people. Is able to create a good learning environment and atmosphere where young people are relaxed and open to share information. Can relate to youth issues and understands their needs/culture. Has previous experience in road safety and understands the basics. Finally, it is essential that young individuals selected commit to running Youth and Road Safety Workshops for the duration of the road safety project in Belize. Write a short motivational letter (not more than 150 words) and explain why road safety is important and how they will cascade the knowledge and skills acquired through this training to their peers and the community. Please submit these along with their CV to the attention of Ms. Jewel Crawford, Director, Department of Youth Services, Ministry of Education, Youth and Sports via E-mail: [email protected] by March 28, 2014. If you have any questions or would need more information about this opportunity, please do not hesitate to contact Ms. Jewel Crawford at 207-0773 or Ms. Pamela Ann Scott at 822-3517. "Stay Safe: YOU ONLY LIVE ONCE!!!"